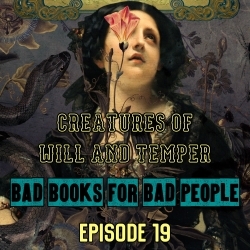 In Creatures of Will and Temper, Molly Tanzer takes elements of Oscar Wilde's The Picture of Dorian Gray and crafts a story of romance, swordplay, and demonology. It's an ambitious premise that goes beyond simply gender-swapping its source material. Listen and find out what Jack, a Wilde scholar, and Kate, a reader with a deep fear of contemporary takes on fin de siecle themes, think about this supernatural adventure. Just how bent do genders get in this story? How much of the artistic process involves drinking, crying, and puking? Will these fencers ever get an opportunity to have some sexytimes? How do demons fit into the worldview of the Aesthetic movement? Find out all this and more in this month's episode of Bad Books for Bad People. NOTE: Your hosts apologize for mis-naming the lead character. Her name is Dorina Gray, not Doriana Gray. The mispronunciation is due to a typo by Kate in the show notes, but we trust this doesn't impact your enjoyment of this episode! Buy Jack's new book, Krevborna: A Gothic Blood Opera, on DriveThruRPG.